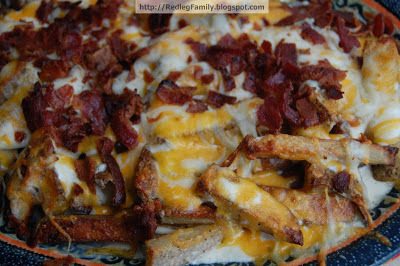 Cheese fries are one of my favorite foods. On the rare occasion that we eat at a chain restaurant, I usually order a salad and cheese fries. When I came across this recipe from Oh So Delicioso, I knew I had to try it right away. I fell in love. Bryan offered to cook dinner for us last night for Mother's Day and asked me to choose the menu. 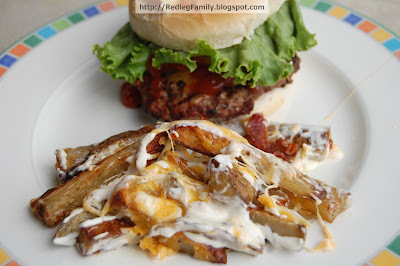 I'm sure he was relieved when I requested a meal as easy as hamburgers and these cheese fries. Some of our friends think Bryan makes the best hamburgers and he was on his game last night. This meal totally hit the spot! The perfect burger (topped with mayo, lettuce, cheddar, pickles and ketchup) and some amazing bacon cheese fries! Cut potatoes into fries. Place in a large ziplock bag and pour in olive oil. Gently shake bag to coat fries. Place fries on a foil lined baking sheet. Sprinkle with seasoning salt. Bake at 400 degrees for approximately 40 minutes. In a small bowl, mix sour cream, ranch dressing & milk. Smooth out 3/4 of the mixture on a large baking dish. Place hot fries in baking dish on top of sour cream-ranch mixture. Drizzle remaining mixture on top of potatoes and sprinkle with toppings. Place under broiler just long enough for the cheese to melt. These look so good!! Cheese fries are the best! !